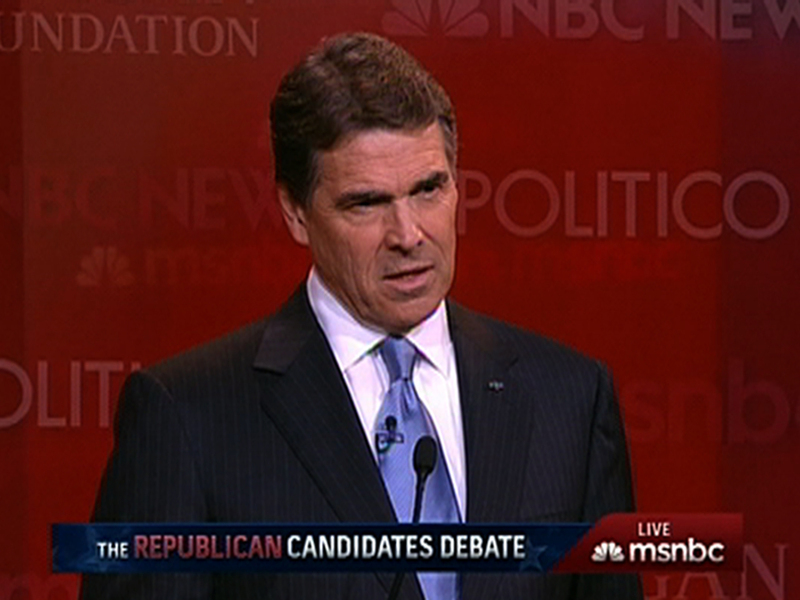 Rick Perry says he doesn't lose sleep over the possibility that his state has executed an innocent man. At Wednesday night's Republican Presidential debate in California, moderator Brian Williams noted to Perry that his state "has executed 234 death row inmates, more than any other governor in modern times." As Williams tried to continue asking his question, the crowd broke into applause, prompting Williams to pause. The moderator then continued: "Have you struggled to sleep at night with the idea that any one of those might have been innocent?" "I've never struggled with that at all," he said. "The state of Texas has a very thoughtful, a very clear process in place of which -- when someone commits the most heinous of crimes against our citizens, they get a fair hearing, they go through an appellate process, they go up to the Supreme Court of the United States, if that's required." Continued Perry: "But in the state of Texas, if you come into our state and you kill one of our children, you kill a police officer, you're involved with another crime and you kill one of our citizens, you will face the ultimate justice in the state of Texas, and that is, you will be executed." In July, the execution of Mexican national Humberto Leal in Texascaused controversy because Leal was not informed he could reach out to the Mexican government for legal help. There was also a lack of DNA evidence in the case. After Perry answered, Williams followed up by noting the audience reaction to his question, asking Perry: "What do you make of that dynamic that just happened here, the mention of the execution of 234 people drew applause?" "I think Americans understand justice," responded the longtime governor. "I think Americans are clearly, in the vast majority of -- of cases, supportive of capital punishment." "When you have committed heinous crimes against our citizens -- and it's a state-by-state issue, but in the state of Texas, our citizens have made that decision, and they made it clear, and they don't want you to commit those crimes against our citizens," he added. "And if you do, you will face the ultimate justice."